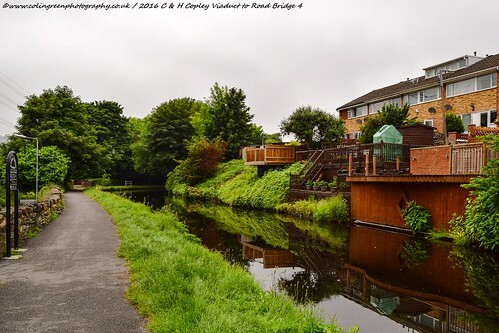 Colin Green Photography: The Calder & Hebble Navigation Canal. Copley Viaduct to Copley Lane Bridge. The Calder & Hebble Navigation Canal. Copley Viaduct to Copley Lane Bridge. 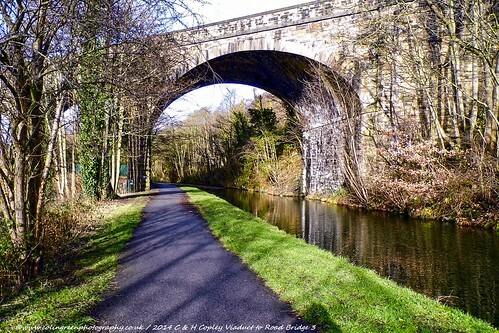 The selection of pictures were taken along the banks of the Calder & Hebble Navigation Canal at Copley, West Yorkshire. They were taken between 2014 and the present day over a distance of 2 furlongs (0.25m / 0.4km) between bridge 6 Copley Railway Viaduct and number 7 Copley Lane Bridge. There are a total of 19 pictures, 7 of which can be seen only on Clickasnap via the links below, and a further 12 available to view here or on Flickr. Path along the Calder & Hebble. The picture shows the canal eastward taken with my back to an out of view viaduct along the tow path. The picture was taken on the 1st February 2014 using a Polaroid iS2132 bridge camera, and is a sepia image. Shows a colour image of the canal looking west along it's bank taken on the 11th June 2016 using Nikon d3300 SLR camera. Curved along the Canal Path. Taken on the 1st February 2014 using a Polaroid iS2132 bridge Camera. 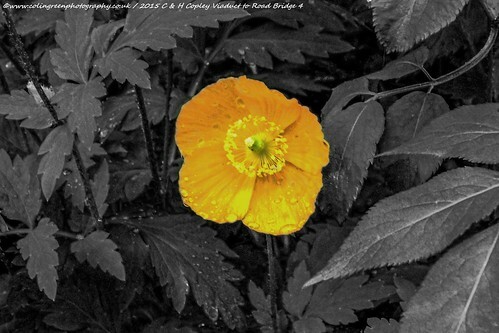 It shows a colour picture taken looking east about half way along the canal bank. Colour picture of the road bridge over the canal taken on the 1st February 2014 using a Polaroid iS2132 Bridge Camera. Taken using a Polaroid iS2132 bridge camera on the 13th June 2015 as a narrowboat was passing under the arch of the Copley Viaduct. Geese on the Canal Bank. Taken on the 13th June 2015 on the side of the canal, there was a flock of geese with what was I think 7 young geese and the 2 adult geese I assume to be the parents. Calder & Hebble Canal at Copley. A black and white picture taken on the 7th May 2017 looking along the canal path. All the links open in another window, and will take you to exclusive to Clickasnap only pictures. Any views of over 10 seconds helps support my photography, as I receive a small contributors fee from them.